High accuracy of 0.5m in both horizontal and vertical direction is realized with DigitalGlobe’s satellites. The product offers wide range line-ups of 0.5m, 1m and 2m mesh product at the same accuracy level. 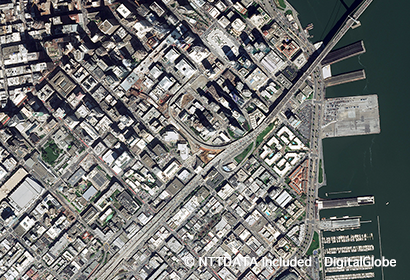 We combine images shot by several satellites and produce high-resolution 3D map. 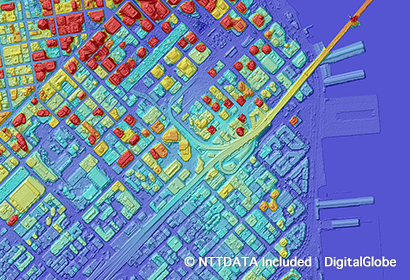 This provides terrain models with such high resolution that detailed variations in tree height can be determined. Since we are generating our DEM data combining multiple high resolution satellite imagery taken with DigitalGlobe satellite constellation, we can efficiently utilize newly taken images as well as our massive collection of archived imagery. This broadens the chance of providing high resolution enhanced data. Cherry-picking the source imagery considering the resolution, the date taken, and other factors based on your request. We also generate DEM data not only from archive imagery but also from a new tasking option. *May vary based on the land characteristic.